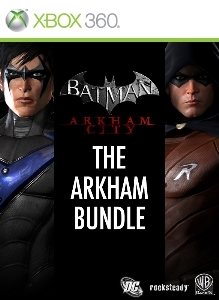 The Arkham Bundle contains the Nightwing Bundle Pack, Robin Bundle Pack and Arkham City Skins Pack. It is three incredible Arkham City DLC packs available for a discounted price! Warning: The Arkham Bundle contains previously released DLC packs. Do not purchase this pack if you have already purchased the previous DLC packs.